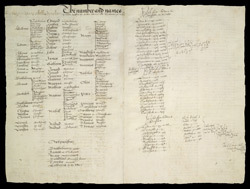 This is a page from an atlas that belonged to William Cecil Lord Burghley, Elizabeth I’s Secretary of State. Burghley used this atlas to illustrate domestic matters. Here the number and names of parishes within the city, liberty, and suburbs of London are recorded and a list of the 'Postes from London' to Holyhead, Tavistock and Bristol. Lord Burghley's computation of their yearly cost is also recorded. Lord Burghley was concerned with communication routes as these were vital to the defence of the country, a central consideration during the reign of Elizabeth I, during which England was continually under threat.